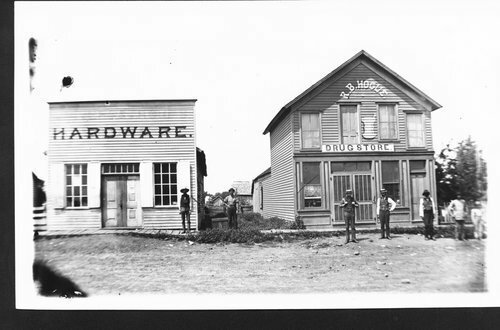 This photograph shows an exterior view of the R. B. Hogue Drug Store and a Hardware store in New Albany, Kansas. The drug store shows the traditional mortar and pestle pharmacy symbol painted on the side of the building. Six men and a boy are visible standing in front of the buildings.